Those who have traveled far on the journey home show true kindness -- applied to all people without exception. This is impossible if we identify with the ego's thought system of separation and differences. 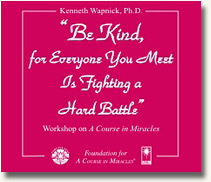 The source of kindness is the mind, not the body, the embodiment of the ego. Asking Jesus' help to be kind, we recognize that everyone who walks this earth fights the same hard battle of dealing with the ego and its thought system of separation and guilt, specialness and attack. By recognizing the oneness of God's Son as a split mind, we undo the barriers of specialness that prevent us from remembering our oneness as Christ, and that "Kindness created us kind."